Cut hot dogs into 1" pieces. Chop onion to make 1/4 cup. Fry bacon bits until crisp. Remove bacon bits and save. Saute onions in bacon grease until light brown. Add hot dog pieces and fry for 5 minutes. Mix in baked beans, lemon juice, Worcestershire sauce, brown sugar, chili powder, ketchup, and garlic salt. Cover with lid and heat to 225 degrees for Simmering. Sprinkle bacon bits on top when served. 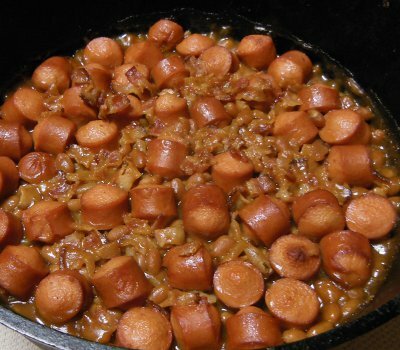 Let me know how you enjoyed your Fancy Franks and Beans!